People are a lot heavier than they were a generation ago, so boats will have to start carrying fewer people. The Coast Guard, using figures from the Centers for Disease Control and Prevention, figures that the typical passenger now weighs in, with clothing, at 185 pounds. In the 1960s, the last time the Coast Guard increased its average passenger weight, they weighed 25 pounds less. So on Dec. 1, the rule to determine how many passengers ferries and charter boats can carry will be changed to 185 pounds. other measures) for full passenger complements at the revised average weight and then some, said George Capacci, WSF’s Deputy Chief of Operations and Construction. It relates to the number of personal floating devices, lifesaving systems and evacuation crowd control, Capacci said. The state’s second 64-car ferry, the Salish, will be conducting builder’s sea trials this week in Puget Sound. It is expected to begin serving the Port Townsend-Coupeville route this summer, restoring full two-boat service to the route for the first time since 2007. Contractor Todd Pacific Shipyards is conducting sea trials to demonstrate the ferry to U.S. Coast Guard and Washington State Ferries inspectors before WSF accepts delivery of it. Later this spring, WSF crews will begin training and familiarization with the Salish on the Port Townsend-Coupeville route to get it ready to sail this summer. The Salish’s sister ship, the Chetzemoka, began service on the Port Townsend-Coupeville route in November. For more information about the Salish, including photos of vessel construction, visit www.wsdot.wa.gov/Projects/Ferries/64CarFerries. I got a tip yesterday from Patrick Sullivan of the Port Townsend Leader that the Hood Canal Bridge was closed from about 10:47 a.m. to 12:25 p.m. Saturday, causing a long traffic backup. Readers said they saw a submarine and a tugboat, leading them to believe the sub was having some trouble and needed a tow. The Department of Transportation said it was an extended naval opening. The Navy said it was a bridge problem. The DOT’s Kelly Stowe finally got to the bottom of things this morning after talking to the maintenance department. There were two switch failures simultaneously on a lift span, which caused the bridge to automatically stop opening. It took the crew time to troubleshoot the problem. Workers bypassed the system to get the span halfway open and let the submarine through. The bridge was closed to traffic for 74 minutes. The crew replaced the two failed switches later Saturday and performed a full test opening to make sure it was operating properly. Orange ferries: Can you say gullible? 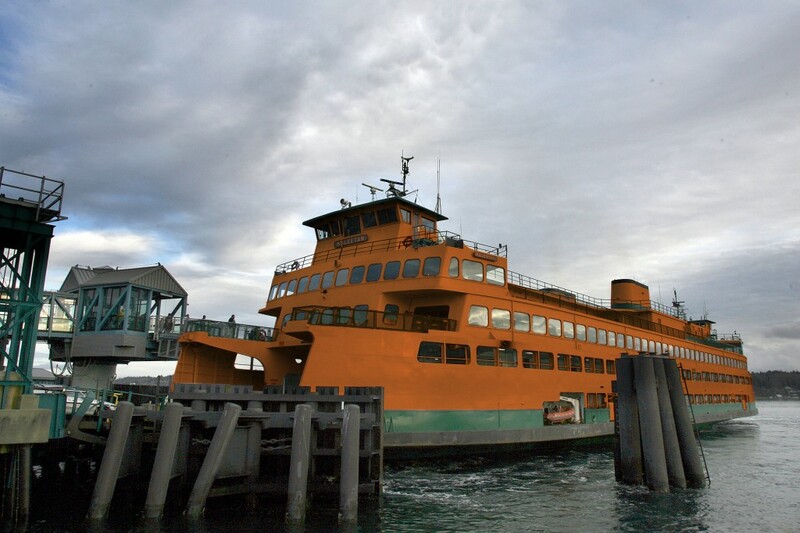 I love the entry on the new Washington State Ferries blog —http://wsdotferries.blogspot.com/ — about our spoof on orange ferries. They call out a couple commenters who actually fell for it and tell them to lighten up. The ferries people have really done it this time. In recognition of National Work Zone Awareness Week, they’ve painted all of the boats orange for a week — April 4-9. WSDOT will also post photos and tributes to roadway workers, and share ideas for work zone safety on its social media sites, including Twitter, Flickr, Facebook and Blogger. Media and others across the state are encouraged to show their orange to honor roadway workers and bring national attention to motorist and worker safety. You can make submissions on the Go Orange for Work Zone Safety website.